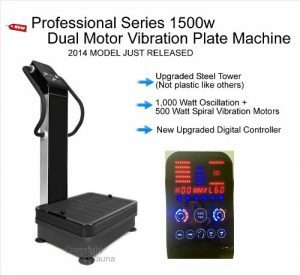 This is a new 2017 model high-end vibration platform with the upgraded high quality 1500 watt dual motors (brushless DC) by SDS Fitness for exercise and fitness purposes. You have the 1000 watt oscillation and 500-watt spiral vibration double motors (2 horsepower) and each one offers you a total of 60 different speeds. It has an advanced red and blue backlit LCD display panel with Speed, Start/Stop, Prog, Standby, Mode, Time+ and Time-, P1, P2, P3 and U1, U2 and U3 buttons and dials. You’ll find the convenient arm straps included in the package so you can work your upper body too. It weighs around 135 pounds and can carry a maximum user or total weight of 400 pounds. 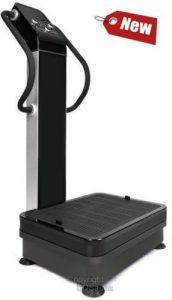 SDS Pro Vibration Platform is offered with a two-year parts warranty by the manufacturer that seems to stand behind their products. And an extended warranty is not on offer at the moment, if you wish to have a longer warranty. This brand new model has a quieter motor, an even sturdier upgraded steel body with a bigger base and area to work on, and a more advanced display panel. 110 Volts, 60 Hz means they are designed for use in North America- the US and Canada, and you can plug it into any regular power outlet. You will get a total package that has the assembly instructions and tools and all the accessories you may need. You can put it together easily in about half an hour as all you need to do is putting the bottom and top parts together. You can use it on any floor- even or uneven, by adjusting the leveling legs. The G-Force is between 2.8 and 17.24 Gs, Triangular Oscillation Amplitude is between 0 and 10mm and the frequency is between 5 and 15 Hz. The Tri-Planer Vibration Amplitude is 2mm and the frequency is between 15 and 40 Hz. One of the customers asked if they could use it with an artificial knee and hip and generally speaking, they probably can at lower settings of up to 30-40. But it is always best that they ask their health care person before starting to use it with their specific condition. You have the integrated pre-set programs that you can use and they should give you a pretty decent workout. You have the user-defined modes as well as these automated exercise programs. It runs quietly and there will be no shaking or rattling during the vibration session and the unit will sit stably on its adjustable legs and the robust metal base. You may use the two motors simultaneously to have the dual amplitude and frequency. There are very similar products on Amazon.com but this one has the obvious price advantage over others at the moment.